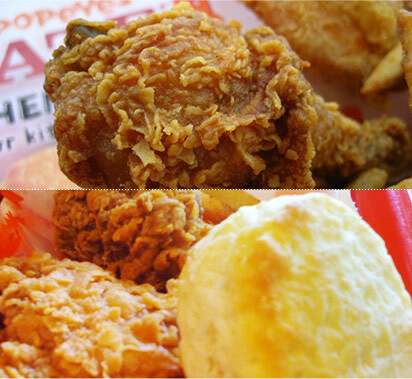 Popeye’s Chicken and Biscuits is a chain of fried chicken fast food restaurants located throughout the states. Years ago, Popeye’s opened a few franchises up North, opening up one as close as Coquitlam, but sadly it eventually closed down. Tre and I make every effort to stop by a Popeye’s whenever we head to the States. As we made our way to Portland, our friends Mike and Virg had wanted to stop by Popeye’s in Renton — not just any other Popeye’s — but this particular one. They claim the chicken here is extra juicy and the biscuits are packed full of buttery goodness. Oh yeah! Tre orders his usual: three pieces of spicy deep fried chicken, spicy fries, biscuit and a strawberry soda. I have my favorite: three piece deep fried spicy chicken strips with a biscuit. Tre’s chicken was really tender and juicy. The outer skin perfectly golden and crispy an nicely seasoned with Popeye’s signature Cajun spice mix. 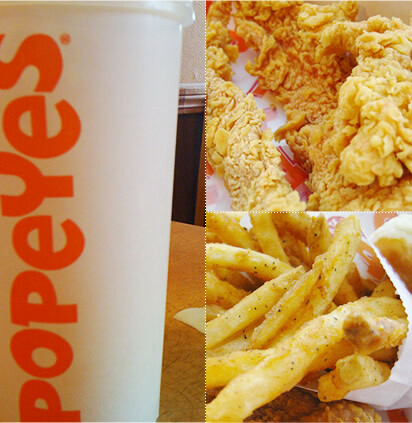 Although the chicken was extra juicy, it was a bit greasier than other Popeye’s we’ve had. My chicken strips were tasty as usual, but the meat was tad dry this time. The chicken strips had a nice light crunch which reminded me more of a panko crust than tradiional batter. The biscuits, though, were so freaking good! They were buttery and slightly flaky, lightly browned on the bottom and crumbled whenever I took a bite. Popeye’s also has some of the best fast food fries as far as I’m concerned: crispy (but not overcooked) and mildly seasoned with Cajun spice. Our friend Steve brought back home something like 10 biscuits — they were that good! Our meal came to just under $13 which is a great deal. If you’re heading to the States, whether it’s just across the border or on the way to Portland, make sure Popeye’s Chicken and Biscuits is one of your stops. Perfect for: Fast food as it really should be.